A new tribute to the innovative life's work of Charles and Ray Eames, the MIOS supports their motto: Design should not only have functionality, it must also be fun! This little brother of the PRIAM provides maximum stability in a lightweight frame, offering an airy, floating appearance. The retro-modern seat design features breathable mesh to not only support the lightweight aspect, but to also help regulate the child's body temperature. The narrow design glides through the urban bustle with ease. 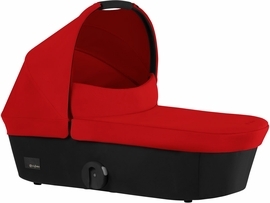 Compact, flexible, functional and stylish - ideally suited to the needs of modern parents. The MIOS is the epitome of the carefree urban lifestyle: Weighing just 19 lbs and measuring a mere 19.7" in width, the MIOS is the ideal companion for parents navigating the city streets. Its compact design is rounded off with smart functionality and maximum comfort. Thanks to its small footprint and front swivel wheels, the MIOS elegantly handles even the narrowest of paths with ease. Be it at the entrance to the subway or in the cozy boutiques of this world.